When you think of online crowdfunding, it’s easy to let your mind jump straight to Kickstarter, which came into its own this year with projects such as the Pebble Watch and Double Fine Adventure. But with an assist from the popular Web comic artist Matthew Inman, a.k.a. The Oatmeal, Kickstarter’s sometime rival Indiegogo has stepped into the spotlight. In August, Inman launched an Indiegogo campaign aimed at helping a nonprofit buy the land for a museum dedicated to the life and works of inventor Nikola Tesla. Inman raised his funding target of $850,000 in under a week. 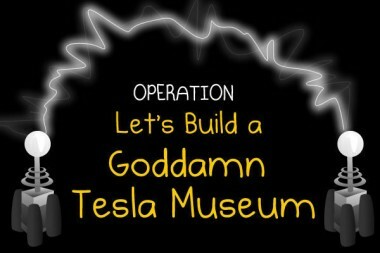 And with less than a day until its funding window closes, “Operation Let’s Build a Goddamn Tesla Museum” has raked in over $1.35 million. Indiegogo co-founder Danae Ringelmann said that makes it the largest campaign in the site’s history. However, Ringelmann said that even without The Oatmeal, Indiegogo already distributes “millions of dollars every single week” to its users. A site spokesperson said the company could not elaborate on those numbers. But by contrast, Kickstarter publicly reports that its users have pledged $350 million since April 28, 2009, which averages out to just under $2 million per week. In any case, Indiegogo will make out nicely from the Tesla museum barnraiser, since it takes a four percent cut of successfully-funded campaigns (as compared to the five percent Kickstarter takes). Ringelmann counters that Indiegogo doesn’t want to have to decide who can fundraise and who can’t. Inman himself did not respond to requests for comment. However, you can read his entertaining ode to Nikola Tesla here, and (at least for a few more hours) donate to the Indiegogo campaign here.